You probably won’t be able to binge a new season of Stranger Things until 2019, according to series star David Harbour, but a new convention might help fill the time before your next visit to Hawkins, Indiana. Organizers recently announced that Stranger Con, a celebration of the hit Netflix series, will be making a stop in nearby Rosemont on June 23 and 24, 2018. Millie Bobbie Brown (the young actress behind Eleven) will headline the two-day event at the Westin O’Hare, which will also include appearances by Noah Schnapp (Will Byers), Joe Keery (Steve Harrington) and Shannon Purser (the dearly departed Barb). Organizers are promising further additions to the lineup in the coming months, including a secret celebrity host who will serve as the master of ceremonies. 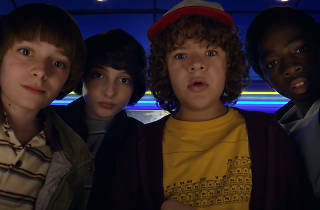 In addition to sitting in on panels with stars who have visited the Upside Down, Stranger Con attendees will be able to participate in an ’80s-themed costume contest, win some cash during a trivia competition and shop in a vendor area that will include items that go beyond the Stranger Things universe. Premium “gold” tickets to Stranger Con (starting at $359) are on sale now and additional ticket options (including regular ol’ general admission tickets) will become available closer to the event. If you want to snag photographs or autographs from any of the actors in attendance, you’ll need to purchase separate tickets through the Stranger Con website. Autographs start at $35 and photos start at $50—getting some face time with a person who has faced down a Demogorgon doesn’t come cheap. Maybe someone can convince Netflix to allow Emporium’s Stranger Things–themed pop-up bar to return for a weekend during the convention?